This sale is for one NIB (new in box). RPS-2000 Recirculating Protein Skimmer by Pacific Coast Import and Octopus. RPS Protein skimmers are made of high-quality acrylic. Recirculating design allows you to use the skimmer inside or outside of a sump. The RPS-2000 is recommended for use in tanks of up to 185 gallons. It has a footprint of 7" x 15" and a height of 26.5. 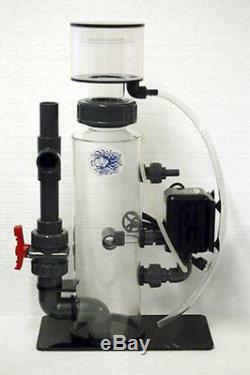 This skimmer includes the Octopus pump with needle wheel impeller. You will need the feed pump (1 to 1.5 times system volume flow per hour). There is a small crazing mark on the collection cup. This is cosmetic defect will not affect any functionality of the skimmer. Experts are learning that protein skimming is critical for marine aquaria, particularly sensitive reef aquaria. As a system matures, protein skimming can become the most important type of filtration. Some of the compounds protein skimmer removes are: soluble proteins, amino acids, organic dyes, fatty acids, carbohydrates, enzymes, detergents, some metal ions, iodine, phosphorus, algae cells, protozoa, bacteria and tiny particles of detritus. Of all the various filtration methods available to the marine aquarist, only protein skimming removes most organic from the system before they break down into toxic ammonia and nitrite compounds. Please pay within five days of purchasing of the item. Since we are located in remote rural area Express Service (next day) is not available. You may return items within. And closed on national holidays. We will not be able to answer any questions during nonworking hours. The item "6 Recirculating Protein skimmer Needle Wheel Octopus RPS-2000 185 Gallon" is in sale since Wednesday, January 06, 2016. This item is in the category "Pet Supplies\Fish & Aquariums\Filters". The seller is "amekaaquatic" and is located in Arcata, California. This item can be shipped to United States, Canada.